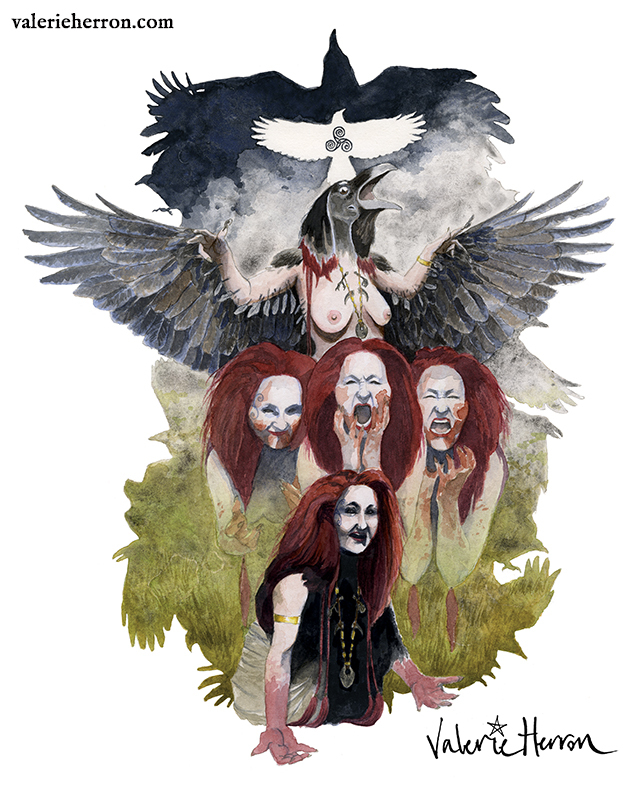 The Morrígan is most well known as an Irish Goddess who often appears in crow or raven form, and is associated with battle, warriors, sovereignty, prophecy, and Otherworld power. Though early source literature referencing Her only exists in Irish, folklore and archaeological records suggest that She, or closely related divinities, were known and worshiped in Britain and Gaul as well, suggesting that we have in Her a pan-Celtic Goddess. The Morrígan’s name translates from the Irish as ‘Great Queen’ (from Old Irish mór=great and rígan=Queen). This name is a key to Her nature, showing that sovereignty and queenship are core aspects of Her identity and power. 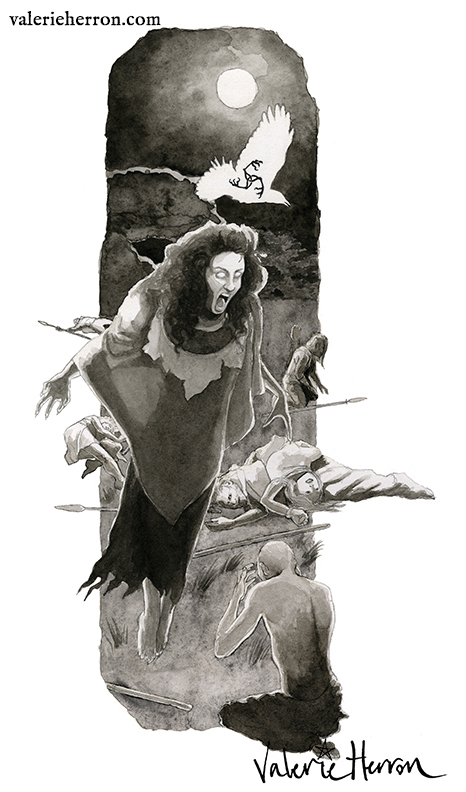 Some scholars have given the name an alternate etymology, translating it as ‘Phantom Queen’ (from proposed Proto-Celtic *mor, connoting terror/nightmare, or *mar, connoting the dead). It should be noted that popular etymologies interpreting the Morrígan’s name as connoting ‘Sea Queen’ (via the Welsh mor=sea) and connecting Her to the Arthurian character Morgan le Fay, are incorrect. As one of the Celtic sovereignty Goddesses, the Morrígan has an association with the land itself, and the rulership and protection of the land and its people. Her seasonal appearances are linked to rituals of warfare and sovereignty as they appear to have been practiced in early Irish society. Archaeological and literary evidence suggests that her earliest manifestations may have been as a tribal/territorial Goddess, and that Her war-bringing and martial functions arose out of this sovereignty and tutelary role. As the Morrígan is best documented in the Irish literature, reflecting early medieval perceptions of Iron Age Celtic society, a cattle-raiding warrior culture, we know Her best as a Goddess of battle, heroes, and the dead. 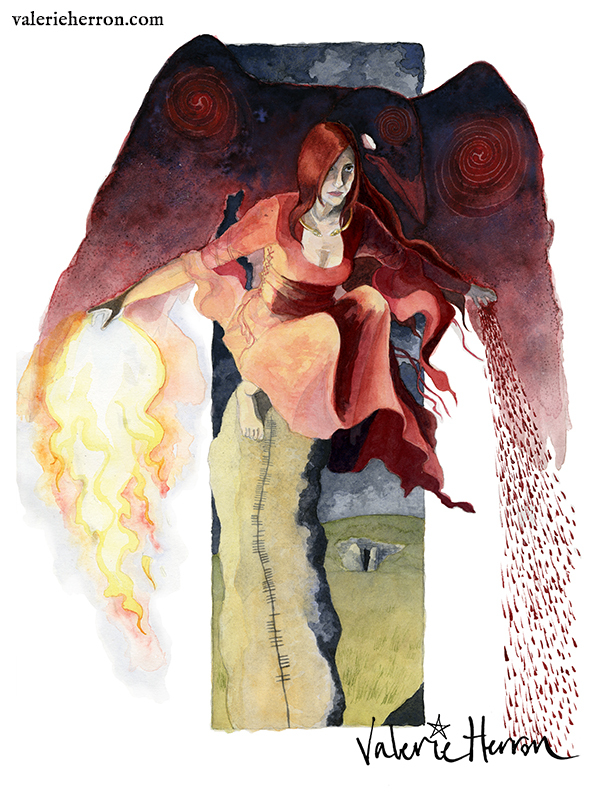 The Morrígan is deeply associated in Her source lore with incitement of heroes toward glory in battle, with the granting of victory, and with their deaths; in Her own words, She says to the great hero Cú Chulainn, “I am guarding your death.” In battle, She takes part in the action primarily through the use of sorcery, Druidic magic, shapeshifting, terrorizing the foe, and giving aid and strategic information to Her people. She shapeshifts into many forms in Her tales, including crow and raven, cow, wolf, eel, and both old and young women. She also appears as a sexual figure, offering victory and prophetic aid to Her chosen war-leader with whom She mates. 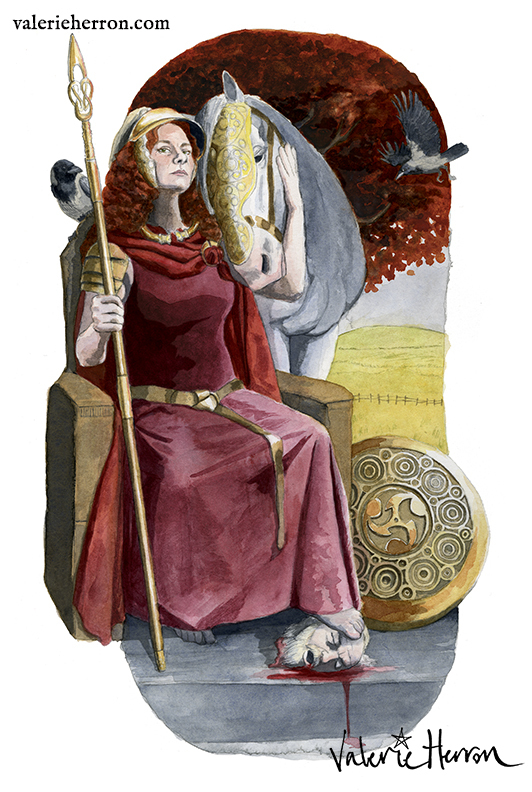 She also fulfills important roles with regard to poetry and prophecy, giving poetic incitements to the heroes of the Tuatha Dé Danann to rise to their hour of need, giving prophetic pronouncements of victory or of doom on the eve of decisive battles, and announcing the victories and the tales of great deeds afterward. A common perception of the Morrígan is that She is a form of ‘the Triple Goddess’. While it is true that in many instances where She appears in the Irish literature, She is described as being one of three ‘sisters’, or is referred to as a trinity directly, it should be understood that the triplicity of the Morrígan is NOT equivalent to modern Wiccan ideas of ‘the Triple Goddess’. The Morrígan cannot be neatly fit into a modern ‘Maiden-Mother-Crone’ trinity based on a rigid model of female reproductive status, nor should we attempt to force Her into that model. Triple-formed deities are very common in Celtic religion. We see examples of this in the three sovereign land Goddesses of Ireland, Ériu, Banba, and Fotla; in the Three Gods of Skill; in the Three Craftsman Gods; and in the Matres or Matrones, Gaulish Celtic Goddesses appearing in groups of three. In each of these examples and many others, the three members of the triad to fulfill related roles as part of a single primary functions. For the ancient Celts, operating within a triune cosmology (land, sky, and underworld/sea), to frame an identity or concept in a triune form conveyed totality. Thus, triads of divinities represent the totality of a set of divine roles or functions, individualized into three characters. In the case of the Morrígan, it does not work to neatly classify Her epiphanies into three distinct identities or faces; for many different names appear in these triune groupings (Morrígan, Badb, Macha, Némain, Féa), and there is not complete consistency in which three appear and how they are described in the literature. Certainly, not one of these Goddesses or aspects of the Morrígan can be neatly identified with a Maiden, Mother or Crone archetype. The name Badb Catha translates as Battle Crow or Raven; from badb=crow/raven, and catha=of battle. This name is exactly cognate to the name documented from the Gaulish, Cathubodua. Generally speaking, this name and aspect have a close association with battle, warriors, and bloodshed, as well as battle sorcery and prophecy. This is also a name that is closely associated with appearances in bird form. The Battle Crow comes as a scavenger bird, omen of war, flying over the battlefield, shrieking prophecies of victory and death for its participants, and feeding on the slaughter in its aftermath. We see hints in the Badb Catha of functions similar to that of the Valkyries in Norse/Germanic culture, following the warrior and gathering the souls of the slain. The name Macha derives from the same root as the Old Irish mag meaning plain or field, as seen in place names such as Mag Tuired. The word macha itself signifies a bounded field, such as a horse paddock or milking yard. Thus Macha is one of the forms most directly linked to land and related concepts of wealth, fertility, and queenship. It should be understood, however, that in Macha we are not dealing with the simple archetypal ‘Earth/Fertility Goddess’. Instead what She embodies is the territorial identity of the land, and its wealth and power as a sovereign and political force. Macha does have a connection to motherhood and childbirth, however, as well as horses, a form of mobile wealth in Celtic society, the hallmark of the elite warrior class, and the most valuable animal that could be raised upon the land. Macha has deep roots associating her to the landscape of Ulster in particular, as its tutelary, sovereign and protective Goddess. As with all sovereignty Goddesses, She is also deeply linked to warfare, and the severed heads on the battlefield were called the ‘mast of Macha’ (harvest of Macha). We also see the Morrígan identified with Némain. The name Némain does not have a single clear meaning; some translators have proposed ‘venomous’; others give a meaning closer to ‘wrath’ or ‘frenzy’. However, these appear to be associative meanings, rather than based on actual etymologies. A compelling theory derives Her name from the proto-Celtic root *nem, meaning sacred, and referenced in Old Irish words like nemed, for priestly/elite status, and nem, sky or heaven. Notably, a related Goddess Nemetona is known from Gaul and Britain, and associated with sacred groves and temple enclosures. Némain is often identified in Irish literature with a role as the wife of a war God called Net or Néit. Her actions and appearances in the lore connect Her to madness, frenzy, terror, and fearful sound. She is said to terrorize armies with a shrieking voice so dreadful that warriors would die of fear on the spot from the sound. For more detailed study of the Morrígan, Her history and appearances in lore, we recommend following this link to our reading list. As most of us today are not engaged in warfare to protect our food supply from cattle raids by neighboring tribes, Her relevance to modern folk has necessarily shifted with changes in culture. For many of us, Her primary role is as a Goddess of Sovereignty – teaching us to honor and to fight to protect our sovereignty, both personal and collective. She also continues to act as an ally for warriors in our time, including all those who put themselves on the line to fight for what they love and value. This includes military service people, martial artists and other physical fighters; but it also can include activists and advocates, and all manner of people who find themselves faced with choices that require a warrior’s courage and commitment to fulfill. The Morrígan also continues to have a hand in the journey of souls who die in war, both soldiers and civilians alike. And She has wisdom and power to share with all of us through Her message that every one of us is descended from heroes and warriors, somewhere in our ancestral lines, and that we each of us carry the heroic blood within us, waiting to rise up and carry us to greatness. When we dare to heed the Morrígan’s call and come to Her as kin, She will claim us as Her own and help us to find that heroic strength within us so that we may be of greater service to all that we love and value.